Benay: [00:00:00] Welcome to Coach Pep Talk, the podcast for people who run their own coaching businesses each week I talk to an expert who shares a wisdom that helps us be better coaches and coaching business owners. Benay: [00:00:14] Coach pep talk is brought to you by Life Coach Office. It’s your one stop shop for managing your coaching business totally online you’ve got access to coaching journals for all of your coaching meetings. Your clients can upload documents you can share files you can upload videos and have classrooms that are predefined and set up all of your clients can reuse if you’re interested in consolidating all the things you’ve got for your coaching business online in one place that you can access from anywhere. Go and check out the life coach office. You can try it for seven days with no credit card or anything required and hop on and see how that’s going to work for your coaching business. You can check it out at lifecoachoffice.com. Benay: [00:01:07] This week I’m so excited to have Karyn Greenstreet on the show. Now Karyn has been a small business coach since the early 90’s and as a part of her business coaching program she was always running Mastermind groups with her coachees and I think she started doing this like 1994 or something so she’s been running Mastermind groups ever since then and is still going. As a side thing she noticed that people were getting stuck on what a Mastermind is, and how to run them for your own business. So she set up a side business where she actually trains people to be excellent Mastermind facilitators. Benay: [00:01:43] So I was so happy when I wrote to her and reached out and said could you please be on the show. I’d love for you to come on and demystify some of the I guess misinformation that’s out there around Mastermind groups and just kind of set my audience straight so that we can all plow forward and use this as an effective tool properly in our own coaching businesses. So Karyn has agreed to come on the show. She helped me out when I ran my first Mastermind back in the early 2000s. I bought one of her workbooks and it was so good so I guess that’s the thing with Karyn is her material is excellent and just got so much integrity and just a lovely personality. So I’m really happy to introduce Karyn Greenstreet to the show. Benay: [00:02:29] All right welcome to the show Karyn. Karyn: [00:02:32] I am so excited to be here. Benay: [00:02:34] It’s amazing to be talking to you because I bought one of your Mastermind workbook’s, I think back in 2009, which is a long time ago now, which got me through my very first Mastermind group and I have to tell you that that workbook blew my mind. It was so amazing. I didn’t really need anything else I was just ready to go to run that Mastermind. Thank you so much for putting such great content out there. Now I know just from being in the coaching industry for so long and being subscribed to so many other gurus and everything’s e-mail lists that there’s a lot of misuse out there with the term of a Mastermind. So I was hoping Karyn that you could kick us off by explaining, you know, really what a Mastermind is and then possibly maybe what it isn’t too so that people have some clarity around that. Karyn: [00:03:20] Yeah, because people use the term Mastermind group a lot of different ways, but the original term came from Napoleon Hill back in actually back in the 1920s. He wrote one book about it and then in the 1930s he wrote ‘Think and Grow Rich’, where he talked about it some more and he actually was talking about the concept of a master mind is like this third mind that’s created when people work together and brainstorm together a topic. So, have you ever been out to lunch with some friends and you sort of bring up a topic, everything starts bouncing around and all of these really cool ideas come up that couldn’t have come individually by these people, but for some reason the synergy of everybody getting together brings forward better ideas, more ideas, richer ideas, than people could do alone so a Mastermind is that additional mind, that synergistic mind that helps you to take all these ideas to a higher level because you’re working in a group. And so a Mastermind group is a group of people that are working together, and brainstorming together, and creating goals and holding each other accountable and supporting each other in success and sharing best practices and shortening the learning curve. Because their peers, they can do that and they have a topic that their interested in. So a Mastermind group is a structure. So what you did with that lunch with your friends, it’s a structured way of doing and you meet it on a consistent basis. You have an agenda for meetings so that you can recreate that Mastermind at will whenever you want to. So by its very definition, Napoleon Hill’s definition, as well as the sort of standard definition, is you have to get to these little brainstorming groups in order for it to be a Mastermind Group. So a Mastermind group is repeatable meetings with a trained facilitator who knows what they’re doing who can understand script dynamics and deepen the discussion. And that help people get into the hot seat so they can talk about their specific situation and everyone focuses on them for whatever time you allow for the hot seat.So something that calls itself a Mastermind group where people don’t get in the hot seat is not a Mastermind group. Something that calls itself a Mastermind group but you don’t get into the hot seat but maybe like once a year isn’t really a Mastermind group, because the value is getting into the hot seat. So I love for them to be as creative as possible with how they want to design their Mastermind group, just the sky’s the limit. And there are no Mastermind group police, so no one’s going to tell you how to run a Mastermind Group. The one thing you have to do is you have to offer people the value of that hot seat. And so it has to be, people have to be able to get into that hot seat on a regular basis and to be able to bring up their challenge, their decision, where the ideas, and everyone focuses on that person for that time period. So therefore that’s the easiest way to judge, is what I’m looking at a Mastermind group or not. Benay: [00:06:15] OK, and what would you recommend is the, I guess meeting schedule for a Mastermind group? And how often you should be as a participant in the hot seat? Any thoughts? Karyn: [00:06:30] Yes, so people, the typical Mastermind group meets once a month for maybe two or three hours and everyone gets in the hot seat at every meeting. Now sometimes the groups are larger and so you meet every other week, and then half the group gets into the hot seat the first meeting of the month and the other half gets in the hot seat the second meeting of the month. But I’ve seen Mastermind groups where they meet quarterly for three days in person. There was a beautiful place to go. And so the hot seats are like an hour long because their meeting for three days. So the how often you meet or how long you meet depends on how you want to do with it. As long as you keep in mind you need enough time for people to get to the hot seat on a regular basis because that’s where they’re going find value, otherwise why should they join a group if they’re not going to get help with what they need help with. And you need to schedule meetings in such a way that they’re regular and consistent because you want to have people set goals meetings and you want people to be held accountable for the goals they set in the last meeting. So you can’t really let it dry out too long because people change their mind about goals and they get stuck and if they get stuck or they don’t have a new group to go back to to say, ‘hey, my goals from last meeting I can’t do this one, I need help. Then they have to wait another whole month for a meeting. So sometimes it’s matter if you have a message forum that you can get on between meetings, and if you get stuck on something that you’re working on so you don’t have to wait a month to get help. Does that make sense? Benay: [00:08:03] Yeah, that makes perfect sense. This is just awesome clarity around what a Mastermind is and what it isn’t’. I have a couple more questions though. So, what do you think this is a good size for a Mastermind group? What’s realistic? Karyn: [00:08:17] Well, of course the thing is of course the bigger the Mastermind group the harder it is to do good brainstorming only because so many people have input that they want to give. And so yes, on one hand you have all these extra brains that you can tap. On the other hand, some people will not be able to participate in conversation just because you run out of time. So the defining thing about how many people should be in a Mastermind group is: How long are your meetings? How long are each hot seats? So say your meetings two hours and your hot seats are 20 minutes, well pretty much you can only do about five people in that group because if everybody gets 20 minutes and you need some time for goal setting, some time for check ins and accountability, some time for anything else you want to do in the meeting. Maybe you have a training piece or something. Five people would be the maximum that you could fit in that group. Now if you’re meeting, you know, once a quarter for three days, you can have 25 people in that group because you’ve got three full days to do hot seats. So it’s how long are your meetings and how long are the hot seats, kind of define how many people are in a group. Now I think 4 is like the absolute minimum, because someone is missing, if someone can’t attend a meeting now you’re down to three. And if two people are missing, then you’re down to two. So you have to have enough brains in the room to be able to really good work. Benay: [00:09:31] That’s just excellent. Okay let’s look at pricing. What kind of price points have you seen around Mastermind groups and what would you like to to say about price and Mastermind groups? Karyn: [00:09:41] All right so let’s talk about the reason why we charge for Mastermind groups, because people say, ‘Oh I can join a free Mastermind group.’ And oh yes you can. Sure absolutely you can. But I see a lot of Masterminds fail, just Google ‘Why do Masterminds fail?’ and see why this happens and sometimes the reason is you’re not getting a commitment from the people. And by asking people to pay into the Mastermind group, they are essentially stepping up and saying this is worth it to me. The other thing quite frankly is that the job of a facilitator is very difficult and it requires a lot of skill, a lot of practice, and a lot of know how. Especially if they’re an expert, you’re also tapping their brain. And so that person should be remunerated for the work that they’re doing because a work is not just running the meetings. There is a whole bunch of stuff that happens behind the scenes that the members don’t know about but it helps the group to be strong. So I have seen Mastermind groups as low as ninety-nine dollars a month and I have seen Mastermind groups that were 36-40,000 dollars a year. So a lot of it depends on who is in the group, and what level are they at. The more experienced level of people on the group the more the price usually is up. If it’s a business related Mastermind group, it is usually more expensive than a personal growth Mastermind group. And who is a facilitator? Is the facilitator an expert in the topic and you’re gonna have access to them during the whole time you’re in the Mastermind group that’s really valuable. So, I’ll give example if people want to work with me individually, they would pay 10 times more than they would pay if they joined a group and yet in a group they can ask me questions 24/7 on the message forum. Now I don’t answer questions 24/7, I do sleep so if they ask me a question, usually once a day I get on the message forum and I answer all the questions. And so what would you pay to have access to something like that. And not only me that is answering questions, but everyone else is answering questions. So you have to think about what is the value, what you try to get out of group, and what are you willing to pay for it. And what are the other alternatives to get the same results. You could take a class, you could read a book, you could work one on one with somebody. So what are those things going to cost you and what is your budget? Benay: [00:11:50] Yeah, yeah that makes sense. So I guess that that price explanation, that’s from if you’re thinking of joining one or you thinking of running one? Karyn: [00:12:00] Well both, both. You know when you’re thinking of joining one you have to think about what is your budget, what are you going to get out of it and of course if you’re going to be creating one yourself and marketing it, it is part of your revenue stream. So you need to calculate what is it that you want to earn and how much, essentially per hour you want to earn. And I know, we all want to stop trading hours for dollars, but the fact is, if you do. You have a certain number of hours in the day Why not leverage and make the most money possible without giving up all your hours and. Right now all I do is run Mastermind groups because when I was working privately with clients, one on one, I was working with 30 clients every month and I was totally maxed out. I could not increase my income because I didn’t have any more time, so when I started to run Mastermind groups I could be earning 500, 700, 1000 dollars an hour whereas working privately with clients I might be working at maybe 350 and hour. So when you’re calculating it, you need to be calculating how many people are in my group and what if I charge this much per hour, or I’m sorry, this much per month or however you want to charge, what increment you want to charge in, but let’s say per month. How many hours am I going to give of my time as a facilitator in the meeting and outside the meetings. Because outside the meeting takes a lot of time as well and when I do the math, how much am I running per hour. And you have to, at a minimum, judge that’s the earning the minimum that you’re willing to accept per hour as the starting place for your pricing and then you increase that up based on your brand, your experience level, your skill levels of facilitator. If you just getting started in Mastermind groups you may not be able to charge as much. If You really don’t know what you’re doing, but as you learn how to be a facilitator and you get practice, you can charge more. Benay: [00:13:50] So okay so I want to jump into this you’ve touched on this a couple of times but it is a two-part question. What makes a great Mastermind facilitator and then can your kind of talk about in that what are some of the behind the scenes work that happens that you don’t realize because you might just think I’m just running the meetings but I that’s two-part question if that’s okay. Karyn: [00:14:13] So yes let’s talk about what makes a good facilitator. I think that’s really important that people understand what the facilitators job is. So the facilitators job of course is to run the meetings. I mean that’s a given, but they also interview all the people to make sure the right people are in the right groups. And then during meetings, they are paying, they’re the observers, so they’re paying really close attention to what’s happening with each person, both what they’re saying and what they’re not saying. They’re listening very deeply and they are taking a 30,000-foot view of each individual member’s success. Where are they, what’s stopping them, what’s how can they help them move forward. Then from there, they are managing a group dynamic, the psychology of the group, how is the group working together, who is interacting and who is not interacting, who is achieving your goals, who’s not achieving their goals. And of course the creating the community, creating that safe nurturing environment so people can feel vulnerable and really share what’s going on and not make the conversations too surface. We really want to dive deep. I mean it’s sort of like if people don’t cry in a Mastermind group meeting you’re not working hard enough, you know. They’re doing all these things then of course they are handling all the administration and they’re also coming into the group as experts and are sharing their expertise. In a lot of Mastermind groups there is a training component, sort of creating lessons for people. Like in my, I have a Mastermind group for Mastermind group facilitators, and I’m creating lesson and I’m running case studies about things, and I am doing open Q & A, putting on the consulting hat and running those meetings. So you know why I might be spending 25 to 30 hours a week for those members. Running the meetings and so you know when you think about what is my job, we have a lot going on. And in the end, your job is to help each member be successful as they define it. So you need to be steeped into the whole psychology of success. How do people succeed and how do people fail and what you can do to help them? And that’s why being a trained facilitator is helpful because you’ll learn how to do those things. Benay: [00:16:43] Where do you start with teaching somebody how to do those things in your work? Karyn: [00:16:49] Well I have been teaching facilitator training class for almost 11 years now and so, and I, you know I built that up slowly. When I first taught the class it was maybe a four week class. And I I I, so here’s a basic need, and I thought about it and every time I taught it, I would add another component to it. So now we talk about everything from how people make the decisions and how to avoid decision making bias, to how to set good goals, and to be held accountable people accountable. How to deal with people who disrupt meetings, you know all that kind of stuff. As things come up I would just keep adding it to the facilitator training because I’ve been running Mastermind groups since the mid 90’s, by the time I was teaching the class, I’d already been running groups for 10 years. I had a lot of experience. I knew, I knew what not to do because I thought I could fix it myself and so I wanted to share all that kind of shorten peoples learning curve so they didn’t have to make all the mistakes I made. Benay: [00:17:48] That’s excellent. Okay, so let’s jump to that other part of the question, you’ve touched on some of the behind the scenes activities that happened that maybe you could just give us a bit of a list. Karyn: [00:17:59] So. So, even from the very beginning, of course the facilitator or whoever is doing the marketing has to do all the marketing. So and the thing is that people want to join your group because they want to work with you as a facilitator, so you can’t outsource your marketing to someone else like their miraculously going to get members for you, you’ve got to be present. People want to get to know you. Then have the head of a whole sales process, which includes interviewing people, getting reviewing applications, reviewing people’s websites or whatever, you know, depending on the nature of your group. Like my group is for business owners who are creating a running Mastermind group. So they all have websites. If you doing personal growth Mastermind group, probably they wouldn’t. So you’re doing all that selection and trying to put the right groups together. You know takes a huge amount of time. And then you are doing all the onboarding, and bringing people into the group, and making sure they have all the paperwork that they need, and making sure that they are introduced into the group if you have an existing group and you’re bring in new members. And then you’re handling of course everything that’s happening in the meeting, or the administration behind the meeting, making sure that people know when the meeting is. In my case I use Zoom for meetings. So what is the video conferencing link? Where are we meeting? Is there lunch? All those logistics, you have to handle all that. You know there’s just so many things that you’re dealing with. Both behind the meetings and in front of the meetings. Now if you’re smart and a good business owner you’re asserting some of this behind the scenes of the meetings my assistant can handle, but some of it you have to handle because they are coming for you. You can’t outsource you. Benay: [00:19:38] Just out of curiosity, you did mention before this message board. What technology are you using for your message board? Karyn: [00:19:45] We’re using it as a message forum that’s built into our site is, called B Bulletin, it’s one of the oldest message forums that are out there. It is extremely stable, but you could do it like in a private Facebook group or a private LinkedIn group. The only problem you have is that some people only want to use Facebook for personal and so they don’t want any business related stuff out there. Or I’ve had people who actually refuse to get a Facebook login, they don’t want it, they hate Facebook for some reason. So you’re better off trying to have a message forum that’s built into your site so that people feel safe, because they’re going to share private stuff out there. You don’t want people to be able to easily copy and paste stuff out of your private group into some public arena. You know, you need a place that’s safe. Benay: [00:20:31] Another thing that I’m kind of hearing between the lines with what you’ve just been saying about how you run your groups, is it sounds like you really get very engaged. You know, there’s this there’s this push out there in the industry to automate everything and be smart, but it kind of is introducing a bit of coldness, or you know, it calls the person away. They’re just a facade that’s on a website and in the videos that you don’t ever actually get to interact with them. Do you, do you have any idea or? Karyn: [00:20:58] Where to start with that question because I don’t even know where to start with that. Benay: [00:21:05] So I’m sensing something right. Karyn: [00:21:06] So let me share, I believe that’s hurting your audience, but if you give them the impression that if they join you you’re going to get you, and then they don’t get you, then you’re lying to them. So that’s pretty simple. And the other thing is, how are you serving them and what quality is serving them? Here’s the way I look at Mastermind groups. That’s the way I look at my private clients, the way I look at my students. This is just my philosophy, and that is I need to tend to my own garden, and these people are my garden. They are my responsibility. They will thrive if I’ve worked with them and they will suffer if I ignore them just like a garden would. 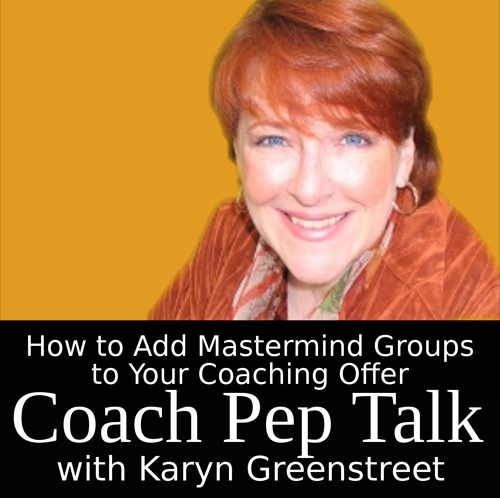 And so if I’m going to say, hey join my Mastermind group, you get to work with Karyn Greenstreet. And then you get into the Mastermind group and you’re working with someone else, even if that other person has been trained by and are absolutely amazing. If I’ve told them in my marketing you’re going to get Karyn Greenstreet, and they don’t, then that’s not right. So what they do is they say oh well you know you’re going to get Karyn Greenstreet, but only at these 50 million dollars a year price. And so it’s really like the elite level. I understand the mindset of that. I understand the business strategy behind that, but you need to be oh so careful in your marketing that you’re not promising them they have access to you, when they won’t. Or you know, clearly tell them, you’re going to be working with one of my consultants, or one of my coaches, or one of my facilitators. You’re not going to be working with me. I don’t have a problem with other people running, each other co-works in the Mastermind group. I’ve worked with hundreds of people have done that, but if you’re saying you’re going to get the person you need to get that person. Karyn: [00:23:05] It’s about integrity. People are complaining. I hear it all the time saying oh I was in a Mastermind group and it was terrible, and I said oh why was it terrible. First of all, the person who was the leader of the Mastermind group, I never saw them, they never communicated with me, I never got in the hot seat, no one never knew what I was working on. It was like this big self-study program, and then when we did have a session there were 50 people in the session, three people got in the hot seat and we didn’t get to brainstorm with that person, that person brainstormed with the coach. And I was like, well that is a group coaching program then, that is not a Mastermind group. that’s a mentoring program. I don’t have a problem with group coaching programs and mentoring programs, but when I sat their Mastermind group and then nobody gets personalized attention, it’s not a Mastermind Group. It’s the intimacy of a Mastermind group that makes it valuable, and that’s why you pay for it. Benay: [00:23:56] Yeah, that’s just great. So we need to start wrapping up, but I’ve just I have two more questions for you. Are there, because you’ve been doing this for such a long time and you’ve got so much wealth of experience. Are there any kind of parting words that you’d want to give to the person with the coaching business, they may have some experience, they might have been doing it a while, or they may just be brand new, thinking about starting a Mastermind, any sort of parting wisdom you’d like to leave with them today. Karyn: [00:24:22] So as I was trying to coach you, I am a coach, so I understand the coaching world and the best advice I can give you is that if you’re a coach you’re already half way to be coming a facilitator. You know about the listening skills. You know about helping people to get to the depths of the situation. You know about a lot of stuff already. So you just need some other training and you’re going to be all set. The other thing is some people will find coaching to be limiting, that we’re not allowed to give advice, or we’re not allowed to do certain things because the parameter being like an ICF type coach, is that you work in a certain way. I have lots of coaches in my synergy program, including people that work at Coach U, who love the idea that they can put on their coaching hat when necessary, their facilitator hat when necessary, their trainer hat when necessary, and their mentor hat when necessary. And they can use 100% of who they are as a Mastermind group facilitator in a way they can’t do as a coach. So my advice to you, is if you’re looking to use all of yourself, if you are looking to use your fullest potential, think about creating a Mastermind group. Think about joining a Mastermind group. I mean, worst case scenario, if you’ve never experienced it, join one, see if you like it. Then if you like it, ask yourself, ‘Do I want this as part of my revenue stream?’ It would be, you know you would do it similar to the way people do good coaching except the there is this advice giving, there is this brainstorming. There are these idea generation things that never happen in group coaching programs. It’s not, it’s not the way coaching officially is supposed to be. Benay: [00:26:01] If coaches out there are really pumped about maybe starting one, but also maybe just joining a Mastermind group, what tips do you have on where to find a good one? Because there is a lot of, kind of misleading information out there. Karyn: [00:26:17] So, I’ll give myself a little plug, if you go to thesuccessalliance.com and there is a big button that says, ‘Find a Mastermind Group’. These are all people I know who are looking for members. You can also go to meetup.com and type in your area and see if there’s a Mastermind group that’s in your area. The problem with meetup.com is that there are a lot of groups that are in there, but there are not actually really active, so you need to contact the person who runs the group and ask them two things. Is your group active? And is it a Mastermind group or is this really just like a group networking meeting. You call it a Mastermind group, but what actually happens in the meeting? From this conversation, we kind of know what should happen in a Mastermind meeting. So you can judge it that way. Or just google ‘find a Mastermind group’ see if there’s anything out there for you. Talk to your friends and your colleagues, see if they belong to one or they know of one that has openings. Or start one of your own. Benay: [00:27:09] Excellent. Okay Karyn that was just fabulous. Is there if somebody does want to learn more about your work, where should they go? Karyn: [00:27:19] Yeah I have a free video tutorial on how to start a Mastermind group. It’s about an hour long. If you go to thesuccessalliance.com you’ll see it on every page. There’s also a section out there that says Free Resources. There are several other video tutorials out there about creative ways to add Mastermind groups to your revenue model for those that are coaches and want another stream of income. So there’s another video out there it’s free and you can sign up for that. And I blog out there with tons of articles. Start there and learn the basics and then see if you want to go further. Benay: [00:27:52] That’s excellent. Thank you so much for being on the show and sharing all of your wealth of information. It was just amazing. Benay: [00:28:01] All right. We’ll see you next time. Thanks.